Chancellor Angela Merkel and President Emmanuel Macron suffer from wavering public support in their home countries, but a new poll shows that the French have an affinity for Merkel, and the Germans are quite fond of Macron. Macron and Merkel have struggled to weather a series of political storms, ranging from the Yellow Vest movement currently shaking France to the electoral whippings that Merkel’s conservative coalition has suffered due to the burgeoning political uprising against her unwavering support for EU dictates. But an opinion poll conducted by Pew Research and released by the Munich Security Conference suggests that Merkel still has plenty of fans – in France, at least. Likewise, Macron could seek refuge from his 28 percent approval rating in January by running for office in Germany – where apparently Germans find him quite trustworthy. According to the 2019 Munich Security Report, 77 percent of German respondents said that they had “confidence” that Emmanuel Macron “would do the right thing regarding world affairs.” Only 68 percent, in contrast, said the same about the German Chancellor. Merkel needn’t feel unloved, however: A full 78 percent of French respondents said they trusted Merkel to do the right thing – while only 64 percent felt the same way about Macron. 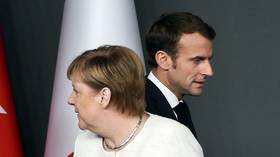 Notably, Merkel and Macron signed a “friendship pact” between their two nations in January, in part, pundits say, in order to drum up support in their respective home countries. Perhaps their real motive was to reach out to their fans…. in neighboring France and Germany? The Pew poll revealed more than Merkel and Macron’s bright political futures (in each other’s countries): Germans, it appears, are highly doubtful of US President Donald Trump’s ability to make sound decisions in the international arena. A measly 10 percent of German respondents said they trusted Trump to do right by the world – compared to 30 percent voicing confidence in Chinese leader Xi Jinping. Russian President Vladimir Putin topped them both, clocking in at 35 percent. German unease about Washington’s leadership abilities was illustrated by a survey recently conducted by Civey, a German polling company. As many as 85 percent of respondents in Germany saw US-German relations in a “negative” or even “very negative” light, according to the survey. Just about 10 percent of respondents had positive opinions about the relationship. Published on Tue, 12 Feb 2019 14:01:00 GMT, © All rights reserved by the publisher.